Our featured tree for January is the Shagbark Hickory, Carya ovata. This deciduous tree, very common to our area, is especially noticeable at this time of year when other woodland trees and foliage do not obscure its bark and form. 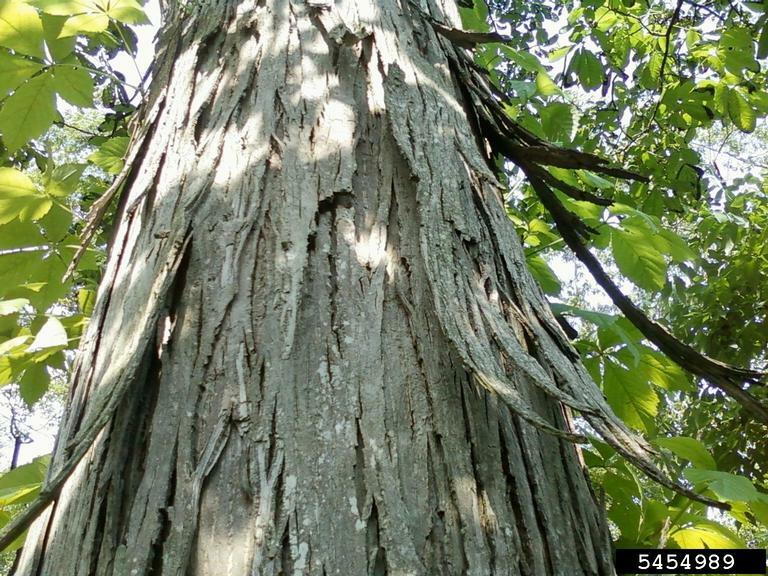 Shagbark Hickory can grow into a very large tree, 60 to 80’ in height and 50’ wide. Its size, slow growth, difficulty in transplanting, and its fruit litter don’t lend themselves easily to ornamental landscaping, but it is abundant and beautiful in all our surrounding woodlands and some partially cleared residential properties from USDA Zones 4 through 8, Quebec to Minnesota , and South to Georgia and Texas. Hickories are very adaptable but prefer a wet to moist, well-drained, deep loamy soil, and full sun to partial shade. In its first season the hickory develops a deep taproot of 2-3’ and this continued deep root growth makes the tree very difficult to transplant, which is why few nurseries grow it. This coarse-textured tree has a straight, cylindrical trunk and very shaggy, grey to brown bark which peels off in large, flat strips. The alternate leaves are compound, meaning that the leaf is divided into separate leaflets, in this case usually 5 and sometimes 7 leaflets. The leaflets are 4-6” long and ½ to 2 ½” wide and have a deep yellow-green foliage in summer and a yellow-golden brown fall color. The whole leaf measures 8 to 14” long. When the leaflets are crushed they emit an apple aroma. The fruit is a hard-shelled nut which the tree drops in October once it reaches about 10 years old; the most nuts are produced when the tree is around 40 years old and will continue until it is about 100 years old. The best crops are reported to occur every 3 to 5 years. The sweet nuts, which in much of our cooking can be substituted for pecans, (a closely related tree) provide important food for squirrels, who bury them as a food reserve, chipmunks, raccoons, fox, deer, mice rabbits, ducks, turkeys and black bears. The word Hickory, comes from the Algonquin Indian word for the tree, “ Pawcohiccora”; Hickory nuts were a significant food in Northern Indian diets and the wood was used for making bows. Today hickory is used extensively not only for its nuts but for fuel and curing meats such as hickory smoked bacon and ham. The wood is very hard and heavy and is used for ploughs and skis, lumber, and tool handles for implements such as axes; the limbs, however, split easily in heavy snow and ice storms. Andrew Jackson was nicknamed “Old Hickory” because of his toughness. Shagbark Hickory is vulnerable to several pests such as the Hickory Beetle, Gall Midges, Gall Aphids, the Painted Hickory Borer, and the Hickory Horned Devil. The fungus Anthracnose is also commonly found on hickory trees.